Greetings again from the darkness. Deciding whether a whistleblower is a hero or a “rat” usually depends on which side of the issue you fall. 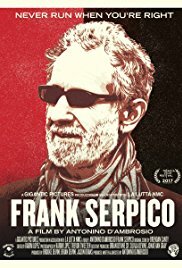 The line is not quite so clear in the case of Frank Serpico, the New York cop who exposed massive corruption in that city’s police department in the late 1960’s and early 1970’s. Of course the crooked cops vilify him as a rat, but even the good cops are divided … some believing a cop should never break ranks and go against another cop. After testifying in 1972, Frank Serpico left it all behind (spending time in Holland). It’s now 45 years later, and director Antonino D’Ambrosio allows him to tell his own story directly to the camera. If you have seen the 1973 film SERPICO (directed by Sidney Lumet and starring Al Pacino), you will recognize some of the referenced stories and situations, and realize how closely the movie followed the Peter Maas book. Despite his theatrical nature – he seems to be a thespian at heart – Mr. Serpico is so committed to truth that we find it difficult to question much of what he says. This is a man that yelled “cut” during the filming of a scene in the movie … he claims the events depicted in the scene never happened, so they shouldn’t be part of the movie. Yes, he was then banned from the set. Serpico’s stories are irresistible and we are captivated by the charm and personality of the now 81 year old who seems both at peace with the past, and crystal clear on what it has meant to his life. There can be a fine line between hero and villain, and sometimes the legend holds up when the facts are known. Through the years, Serpico has remained true to his ideals … the same ideals that were present when he was a kid working at his immigrant father’s shoe shine store. The film’s presentation is terrific as Serpico takes us on a tour of that old family business (now a diner), his childhood home, and first Greenwich Village apartment. He then meets up with Arthur Cesare, one of his partners that fateful night of February 3, 1971. A drug bust resulted in Frank being shot in the face and leading to questions of a set-up and slow police response. These are straight talking New Yorkers who uncharacteristically dance around the topic, leading us to believe there is something to the rumor. It’s a powerful segment. The clips and photographs take us back to that era, and there are interviews from neighbors, friends, partners, Ramsey Clark (his attorney), journalists, writers, and other cops. It seems clear that payoffs were “part of the scene”, and that some cops were simply too afraid to not go along. We see the distinctive New York magazine cover showing Serpico’s skull with the bullet visible in the x-ray. Actor John Turturro describes him as an inspiration, while others state Serpico suffers from PTSD (who could blame him?). “Never run when you’re right.” That’s the advice Frank says he got from his father, and what we see on screen is a man who refused to accept the corruption of an institution he believed should be above it all. He accepts the hate from those who see him as anything but true blue, and also refuses to see himself as the hero who stood up when someone needed to. On what side of the line do you fall? This entry was posted on Thursday, November 2nd, 2017 at 8:18 pm and is filed under Documentary. You can follow any responses to this entry through the RSS 2.0 feed. You can leave a response, or trackback from your own site.